The image below is one of four precipitation models published by the National Center for Atmospheric Research (NCAR) that together forecast extreme global drought less than 50 years from now as a consequence of climate change. 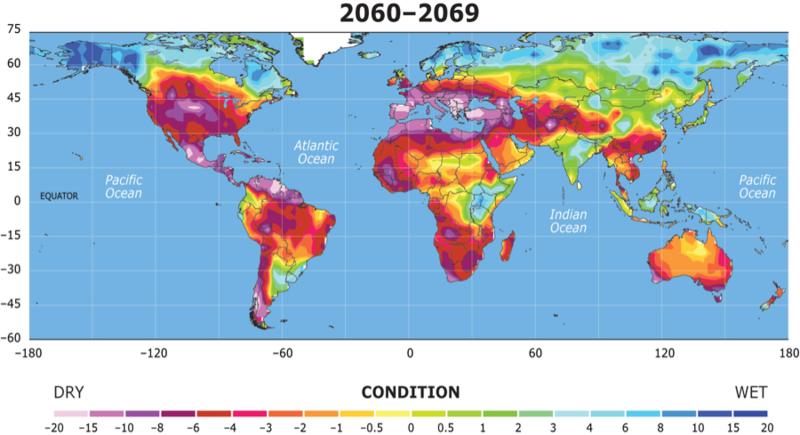 What follows illustrates predicted global precipitation levels in 2060-2069 assuming a moderate greenhouse gas emissions scenario as defined by the International Panel on Climate Change. Moderate. Take a moment to let all the purple, red, and yellow sink in. These are Dust Bowl conditions and worse. Take another moment. It is difficult to emphasize enough the gravity of this predicted drought. We should all keep the above image in mind when we consider the value of water. Water is fundamental to the existence of life as we know it. Not just human beings. All life on Earth. For obvious utilitarian and deontological reasons, by the land ethic and the difference principle, by the precautionary and proactionary principles, and by our natural moral sense, water is of the highest non-arbitrary value and it is our responsibility as constituents of the human world and of the Earth itself—if we even entertain such a distinction—to do everything in our power to prevent and prepare for this possibility. Pause to consider what it would mean for governance, for geopolitics, for the world if we fail to curb climate change beyond this moderate GHG emissions path and simultaneously 1) fail to implement and enforce the universal human right to water as recognized by 122 countries of the UN in 2010, and/or 2) consent to the privatization of water resources by multi-national corporations. I, for one, would not welcome our new hydroverlords. Water resource management, conservation, and preservation will likely fall into their own compartmentalized regime complexes—as discussed by Keohane and Victor—fragmented from other initiatives focused on mitigating and adapting to the various impacts of climate change. According to Keohane and Victor, there’s reason to be optimistic about the capacities of this regime structure. But simply adapting to new conditions of water scarcity equates to treating the symptom rather than the disease. While adaptation is absolutely necessary, we must simultaneously confront climate change at its source: human greenhouse gas emissions (carbon dioxide, methane, nitrous oxide, etc.) and the several positive feedback cycles that global warming entails. Atmospheric carbon dioxide concentrations alone are currently around 397 parts per million (ppm), which essentially guarantees an increase in average global temperatures of ~4 degrees Fahrenheit (~2 degrees Celsius). What’s more, unless we reduce GHG emissions by ~80%, we can expect the increase in average global temperature to be even more dramatic. Confronting climate change means one of two things (and maybe both, but probably not—the former would render the latter largely unnecessary and the latter would likely preclude the former). We must reduce greenhouse gas emissions through 1) an immediate significant reduction in energy consumption or 2) a techno-scientific revolution in renewable energy, energy storage, energy transmission, transportation, agriculture, infrastructure, manufacturing, and architecture. Coupling either approach with reforestation and afforestation projects would be a good idea too, especially considering the Brazilian government’s recent report that deforestation in the Amazon has actually gotten worse since May of 2012. In all likelihood, the future holds an increase in energy consumption, not a decrease, so we must—at some level—prepare ourselves to rely on faith in Julian Simon’s infinite resource of the human mind to spark the large-scale techno-scientific advances that the climatic consequences of our industrial behavior demand. We must have faith in progress, despite the paradox therein. 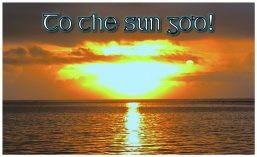 A daunting task, to be sure, but we have little choice as we have collectively agreed, both implicitly and explicitly, that the Good Life is an energy intensive one. The climate challenge is upon us. If we are to progress, we must progress toward sustainability—and hopefully to a future with more water than NCAR has predicted. Let’s get it together, humans.